Earlier this week the Omni Group released updates to OmniFocus for Mac and iOS that make it possible to gain access to OmniFocus Pro for Mac, iOS, and the Web through a monthly ($9.99 USD a month) or annual ($99.99 USD a year) subscription fee. This represents a significant milestone in their mission to make OmniFocus available on the web. Read on for details. As it stands, you can subscribe to OmniFocus through an in-app purchase in OmniFocus for iOS. This subscription is linked to your Omni Sync Server account, granting you access to OmniFocus Pro on all of your Mac and iOS devices and allowing you to access your OmniFocus database from a Mac or Windows computer at: web.omnifocus.com. If you don’t already own OmniFocus Pro for Mac and iOS and have a need for OmniFocus for the Web, this could be an attractive option. Either way, you’ll continue to have the option to purchase the Mac and iOS apps separately. You’ll soon be able to subscribe to OmniFocus for the Web separately from the Mac and iOS apps, at a rate of $4.99 USD a month. It’s important to note that OmniFocus for the Web is intended as a complement to the Mac and iOS apps and is not designed to be used as a stand-alone app. Without a subscription, you won’t be able to login to your Omni Sync Server account at web.omnifocus.com. Until a separate subscription is available, you’ll continue to be able to access OmniFocus for the Web through a desktop web browser of choice by going to test.omnifocus.com. 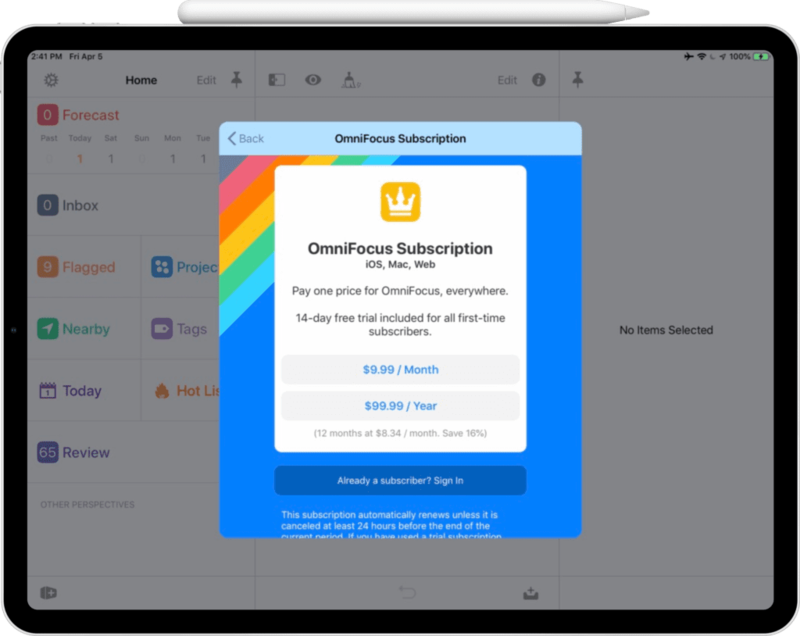 To learn more about subscriptions, check out the Omni Group’s OmniFocus for the Web Subscriptions support article. And reach out to their support team with any questions that you have. We’re working on content to help you get the most out of OmniFocus for the Web, including guidelines on how to make productive use of OmniFocus for the Web alongside the Mac and iOS apps. Among other things, this will include tips for using tags to springboard into your most important projects and strategies for batching similar types of work for maximum efficiency. Thanks and kudos to the Omni Group for all the work that they’ve been doing to bring OmniFocus to the web and to support subscriptions. Both are major undertakings that will help pave the way for future developments. If you’re interested in a behind-the-scenes perspective on OmniFocus for the Web, check out Episode 27 of The Omni Show: How We Built OmniFocus for the Web. Among other things, you’ll learn that OmniFocus for the Web runs on Macs and why the Omni Group opted for a subscription model.